Posted on July 7, 2015 by xellers. 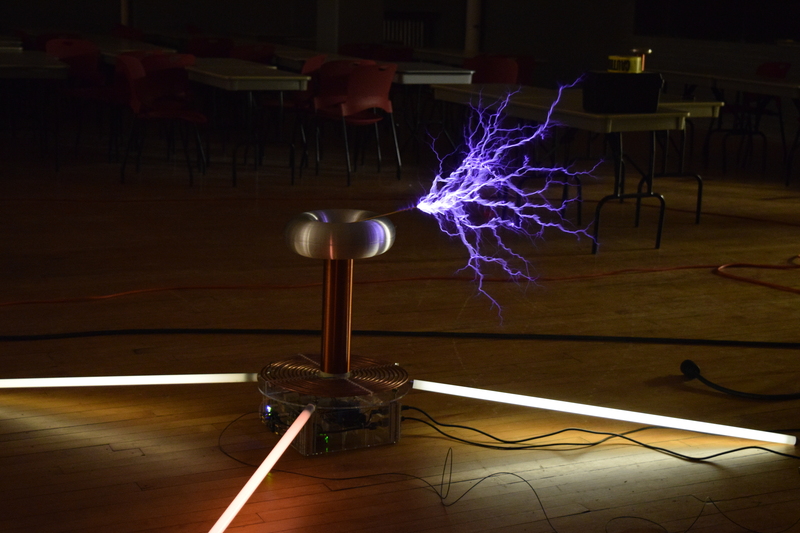 This entry was posted in Power Electronics, Tesla Coils, Uncategorized. Bookmark the permalink. 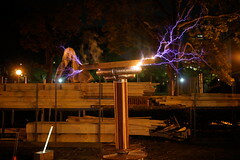 Yes, and this is accomplished using a self-tuning feedback controller such as Steve Ward’s Universal DRSSTC Driver (try searching the archives on 4hv.org for more information and documentation). Gao Guangyan sells assembled boards. I bought one of these pcb’s for a wireless inductive charger project. It has not arrived yet but I need a 100 kHz 110 V square wave to come out of the h-bridge. Would the standard list of components you have posted here work for that purpose? If not can you please give me some pointers as to what components to get? Yes, this board can be used for that. You will need to design and build your own driver to generate the gate drive waveforms required for your application. 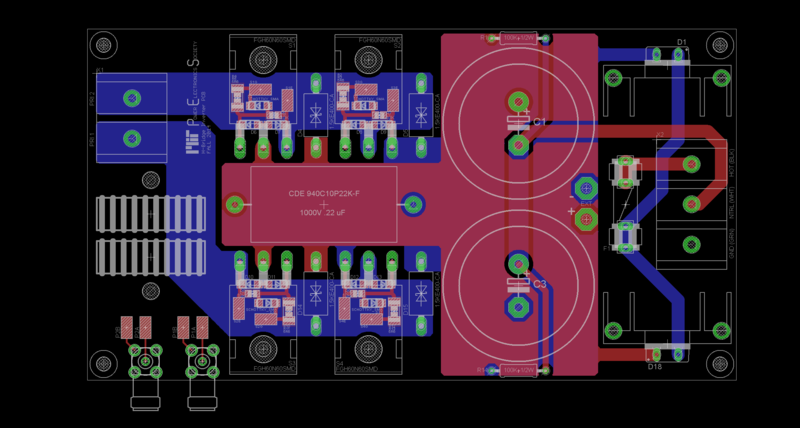 Would a 555 timer IC be a good choice to drive the transistors and how can I integrate that into the board because I’m looking at the schematics and the PCB layout and I don’t see a place for a gate driver IC but maybe since I’m a complete newbie I’m missing something. I’m an ME student doing this as a senior project and the deadline is fast approaching so I’d greatly appreciate any help. The GDT1 on steve wards driver board carries the inverted signal which connects to one of the GDTs on the h-bridge and GDT2 from the driver board carries the non-inverted signal which connects to the other GDT on the h-bridge. Is my logic correct here? Both outputs of the UD are phased the same iirc; you need to flip the primary phasing of one of the GDTs. You can always check the phasing of the signals with an oscilloscope and reverse GDT windings until you get it right. Make sure to use a current limited bench supply for testing in case you get it wrong. You will need a separate board that generates the gate drive waveforms. This board has solder pads and SMA connectors for feeding the drive signals in. Remember that you will need to buffer your waveform with gate driver ICs and generate a symmetric differential waveform, otherwise the GDT cores will saturate. Yes, you can just feed your input signal into the feedback CT input, short the OCD CT input so that noise doesn’t trip the current limit, and pull the interrupter input high. 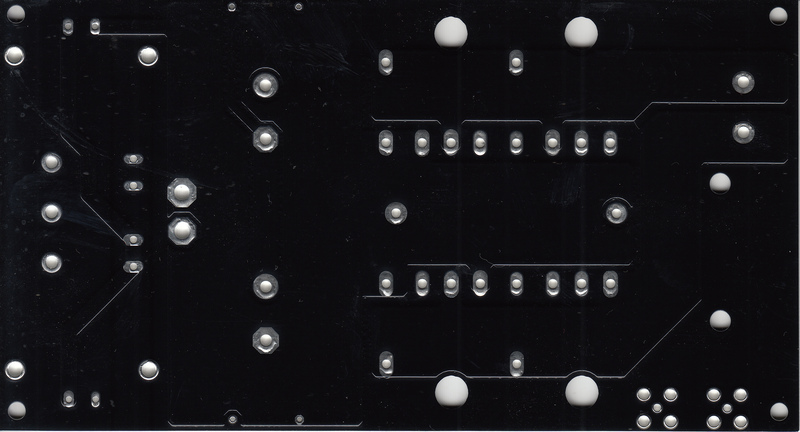 Yes it would work fine but it’s a bit expensive if you don’t really need all of the other functionality, however it is a very robust method of driving the bridge and you can get assembled boards if you don’t like SMD soldering. Sorry for hounding you again. I’ve tried to buy Steve Ward’s self tuning feedback controller board but I think they’re out of stock because they did not reply. Are there any other self-tuning controller boards out there that I could use to drive this h-bridge. Please help! When you say pull the interrupter input high do you mean that I don’t need to use an interrupter along with the driver board and just connect the driver board interrupter input pin to a 5 V rail? Yes, and you don’t need to install any fiber optic receivers. I’m confused about the 5.6 ohm resistors near each IGBT. For example, R2 and R3 seem to refer to the same pad. The schematic also shows two 5.6 ohm resistors at this same location. Are we supposed to stack two 5.6 ohm resistors on top of each other at these locations? Thanks in advance. It’s a dual footprint — you can use whichever size resistor you find more convenient for your needs. You cannot install both sizes of resistors simultaneously.